While we have discussed Sodium Lauryl Sulfate in depth we also get quite a few questions on Sodium Laureth Sulfate. In particular people want to know if it’s dangerous, what it’s made from, if it’s really just the same thing as SLS or how it compares to SLS. In this article I will attempt to answer these questions and provide a basic overview of SLES and why it’s also common in your personal hygiene products. Some of the information is more technical in nature but I have attempted to summarize this where possible and provide a general overview. What is Sodium Laureth Sulfate? 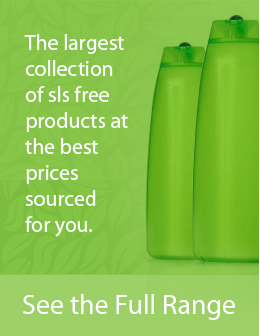 SLES is similar to Sodium Lauryl Sulfate. Both are essentially detergents added to cleaning products. It’s a very effective foaming agent and is also inexpensive to produce much like SLS. The cost is why it’s used in a number of cleaning products, ranging from personal hygiene products such as toothpastes and shampoos to industrial cleaners and household detergents. SLES has both cleansing and emulsifying properties. This means that it’s partly soluble in both water and oil. That is why it’s ideal for use in cosmetic products. Umulsifiers are a type of surfactant and are available in a number of different forms. While the term surfactant can be applied to any material that reduces the surface tension of a liquid. Emulsifiers are more or less a binding agent. Consider how oil and water will separate when combined. An emulsifier will allow these two materials to bind which is useful for personal hygiene products and food additives where ingredients need to work together but will separate if not treated with an Emulsifier. If you are wary of products containing SLES you should get in the habit of reading labels on your personal hygiene products. Surfactants have almost the same characteristics as soap, in that both are considered detergents. However, their emulsifying and cleansing properties enable them to trap oil, dirt and grease. When washing your hair, SLES molecules dissolve oily dirt and grease in the hair. Surfactants, also being partly soluble in water, make it possible to remove the oil, dirt and grease when you rinse your hair with water. SLES also forms very thick foam while in use. But it should be noted that foam does not remove dirt. It mostly reduces friction between your hands and hair while you are scrubbing and helps in the mechanical removal of dirt when you are cleaning your hair. Both SLES and SLS are found in cleaning products and are in most cases a product of petroleum. However both can also be extracted from Coconut Oil and often are then promoted as a ‘natural product’. This however is not really the case. This isn’t to say Coconut Oil is a skin irritant as the process involves extracting alcohols from the coconut oil, and processing it with petrochemicals thus creating SLES or SLS. At this point it’s no longer considered coconut oil. Products that contain SLS usually cause more irritation than those from SLES. To make SLS less irritating to humans, Ethylene Oxide is added and 1,4 Dioxane is produced as a by product. When Ethoxylation (the process involved in adding ethylene oxide) has taken place this changes the compound from Sodium Lauryl Sulfate (SLS) to SLES. Ethylene Oxide is considered a possible human carcinogen. Ethylene oxide is also considered possibly harmful to the central nervous system. It has been observed that Ethylene Oxide may interfere with normal human development, making it a developmental toxicant. A Developmental Toxicant can cause complications such as birth defects and should especially be avoided while pregnant. 1,4 Dioxane is also considered a possible human carcinogen. Manufacturers are encouraged to remove 1, 4-dioxane from their products before releasing them to the public. 1, 4-dioxane can be removed from cosmetic and cleansing products during manufacturing through a process known as vacuum stripping. However, when the products are on the shelves, there’s really no way to tell if that has taken place. While both Dioxane and Ethylene Oxide are banned in Europe and Canada they are not banned when used as a ‘contaminant’ as described above during the process of transformation from SLS to SLES. After assessing products containing SLS and SLES, Health Canada concluded that SLES is not toxic. This is because the concentration of SLES found in the products was found to be way lower than those estimated to cause danger to humans. The assessment also noted that the exposure limit in the consumer products was low. Consequently, these products were declared safe for use by humans. What is left unanswered is the compound effect of these chemicals on the body, especially as products like Toothpaste and Shampoos are used daily and residual levels build up over time. SLES also takes a very long time to break down. You may have more questions than answers due to the suggested health implications in the process of transforming SLS to SLES. The truth is there are many questions left unanswered. Even respected scientists such as David Suzuki are wary of this process. However it should be pointed out much of the information listed about Dioxane and Ethylene Oxide is based on the pure form and not a contaminant as used in many of the personal hygiene products discussed on the site. Many are suspicious however of the residual effect of these ingredients building up over time and this is where you will need to make up your own mind. What is Disodium Laureth Sulfosuccinate?